Readers' Theatre - HAPPINESS IS WATERMELON SHAPED! 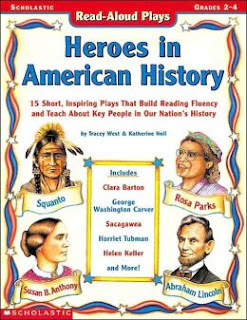 Right now we are currently preparing to perform three plays from this book: Busy Ben Franklin, The Truth About George Washington, and Betsy Ross and the American Flag. During the afternoons we practice our plays, and next week, we're going to take our plays on the road to other classrooms in the school. The kids are really excited about these plays; they have made props and pictures. I am delighted to be your first follower!